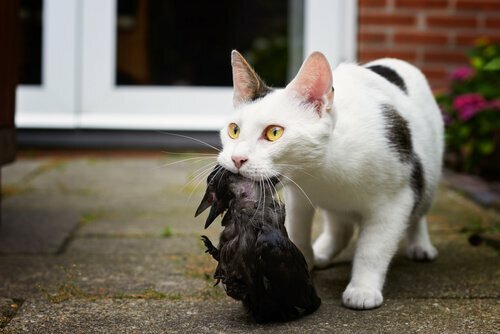 Unlike wild cats, who hunt instinctively for food, domesticated cats need to learn to hunt , for the simple reason that it is not a vital necessity for them. How do they learn to hunt? How can you stimulate your instincts? The mother of a domesticated cat is the first to play a role in the development of a kitten's hunting instinct . Kittens learn the basics of hunting around five weeks of age, as soon as they can walk alone, by observing the mother's behavior. Not only does she attack her prey and she He eats in front of his kittens, but also produces sounds to attract his attention. Then, she brings the prey to the kittens and begins to eat the animal. The kittens will start playing with the prey and, after a while, the little kittens will go hunting alone. Around the 8 weeks, the kittens stop playing with the prey and begin to behave like real hunters. When the cats go hunting, this becomes more important than the game. However, after catching the prey and eating it, they easily return to play with their siblings. Some kittens do not have the opportunity to learn the basic concepts of hunting with your mother and you may want to get involved in its development. You can stimulate your kitten with certain activities like chase games and false prey . You must take precautions and, instead of using your hands directly, try to find a ball small or a pen attached to a string. When they learn cats to hunt they develop a very precise and organized technique. First they locate the prey. Then they perform several maneuvers to get closer, such as lying down and moving furtively to go unnoticed. Retract their hind legs when they get close enough to their prey and, finally, make their sprint or jump to catch the victim. The cats are 'equipped' with a very sensitive sense of hearing and can identify noise and ultrasound produced by their prey. Sometimes they are heard from several kilometers away. It is recommended that you avoid your kitten escaping too far in its first days of hunting . You can use the products that track your movements and thus find it easily when your hunting expeditions go on too long. The sight of the cats allows you to link the image with the sounds , while the smell seems to play a minor papal. 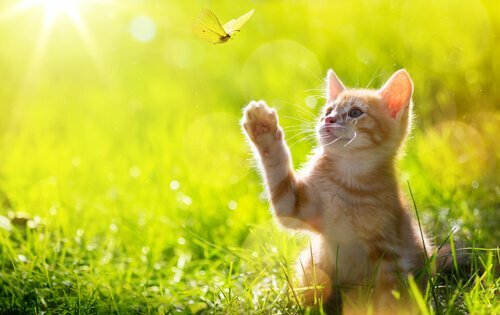 The sense of taste is complementary to the other senses and helps cats choose the most delicious prey, instead of bitter insects. The behavior that drives cats to hunt has benefited us for a long time by keeping rodent populations low . However, these days the predation on the part of the cats has never been more controversial. strong>, especially when birds are their prey. It is worth noting, however, that some biologists indicate that wild cats survive mainly from theft, not from hunting .And so will the debate on how to keep cats indoors. Fishing also requires skill and high doses of patience . Normally, the cat waits in a semiaparted place until the right candidate appears, then uses a paw like a spoon to get the fish out of the water. In shallow water, the cat can use both legs when pouncing and grabbing the fish. Not all cats are capable of perfecting the fishing technique , probably due to the difficulty of visual contact with respect to water. But, even kittens that live in dry lands, use the technique of the spoon to 'fish' in a possible hole from which something delicious could come out.